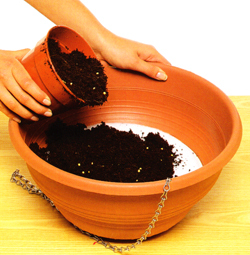 It is not generally understood that most potting composts contain sufficient food for only 6 weeks of plant growth. After that the flowers will slowly starve unless more food is provided. There are several products available that are easy to use and a breeze to find. A slow release plant food in granules is easy to use, available everywhere and really reliable when added to your potted containers. For these to be the most effective the soil you plant in needs to remain moist. Slow release plant granules really are the best to use. Just one dose can keep your potted plants and flowers looking wonderful for many months. Just follow the manufacturers instructions for recommendations. They come come in different forms also, like liquid, pots, pellets etc. Just go to your local nursery and read the containers or ask for help. It is worth taking the time on this step. 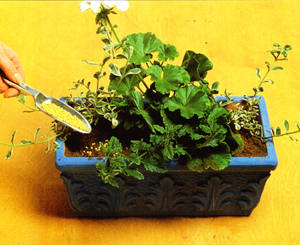 A slow release plant food can be added to the potting mix before filling the container. When adding it to soil sprinkle i on the surface and then use a small hand rake to mix it into the soil or compost. They should be pushed down below the surface by about 1". Give your potted plants and flowers the best chance of growing lush and bountiful by using a simple fertilizer in the potting mix and see what works best for you. It's easy and fun to do. Read more.....Plants for window boxes. Read more.....Conifers in garden pottery.